At a recent ministry concert I had not gotten enough sleep and my voice didn’t have much range. I had also forgotten to eat or bring anything to eat and was feeling very weak. In spite of all this, and my headache, it was one of the best concerts ever! Are you prepared to bring heaven some joy today? Come to him! Jesus happens to be addressing Christians here. This is why I say it is wonderfully appropriate at the outset of every new day to open the door of our hearts and invite Jesus in to fellowship – to “share a meal together as friends” as he puts it. 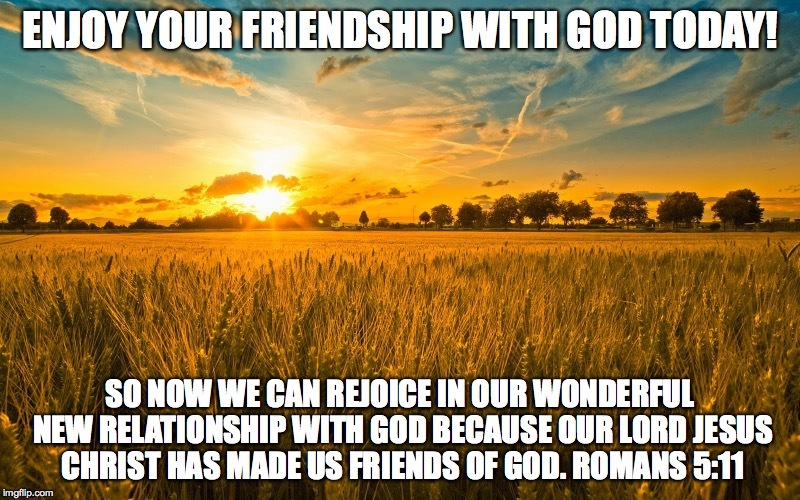 Enjoy your friendship with God today! Here is a video of a song that fits this blogs idea perfectly. You Have God’s Permission to Brag! I have been working out lately. By lately I mean the last few years. I have recently stepped it up a notch and wanted to share my milestones with the world so I got MapMyRun app for my new smartphone and logged a few 5K’s for all my “friends” on facebook to see and think I’m awesome! (Tip: By the way it’s more impressive to say “I just ran a 5K!” rather than “I ran just over 3 miles”). I also recently shared a status from my progress on hundredpushups.com program (that I happen to be currently failing at) with the caveat, “not meaning to brag or anything but check out how many push-ups I can do! Aren’t I awesome?” (I didn’t really say it like that). WE WERE CREATED TO BRAG! We are all made to worship. Boasting is a form of worship, so boasting is part of the human DNA. We must give praise to something. But boasting about our accomplishments, our stuff, or our smarts is the DNA of the world. The follower of Jesus makes their boast in God. God, and more specifically your relationship with God. I was thinking about how foolish it is for someone to boast in their intelligence for instance (or to put others down for lack of it). Do they fool themselves into thinking that they are the source and giver of their own intelligence? Last I checked, God was the source of all wisdom and dispenses it as he pleases. So we all have a measure of smarts that came from him. And then we have the gall to boast of it? Or compare ourselves to others? Aren’t our accomplishments also God given? After all, He gives us the ability to achieve. But why are we achieving anything anyway? Are we simply achieving for ourselves? For others? Or is it to inflate our sense of self-worth? Anything you can think of is all gift from the giver, so how can we boast in a gift? I realized I haven’t posted anything ‘God related’ in a while. I just want you to know that I am enjoying life and my relationship with God a great deal more than I ever have and am probably less religious than I ever have been as well. I know God. He is a constant source of comfort and delight to me. He blesses me as much as I am willing to receive. He continues to forgive all my sins and showers me with affection and love just as I do my own daughter. I want the same for you. I want you to experience life with God as well. If you haven’t yet begun a relationship with God through Jesus, make it happen. I am not going to give you some religious formula, because there is none. It is a relationship and will require investment and commitment on your part as any relationship does. God is already 100% committed to you. He is all in. If you want to know God like I do (or better than I do) then I recommend talking with him about it and asking for that relationship. Read the Gospel of John, and if you really want all that God has for you, then prayerfully read the whole Bible and always keep reading. God has shared his thoughts, his heart and soul with you in his book. I’d love to be a friend to you and help you along the journey.